In a national dialogue held on September 25 and 26, advocates reflected on the reproductive health (RH) situation in the Philippines since the enactment of the Responsible Parenthood and Reproductive Health (RPRH) Law. Participants in the two-day event entitled “5 Taon, 5 Hamon” discussed challenges to the full implementation of the law and consolidated recommendations in addressing gaps in policy and implementation through four plenary sessions on the following topics: local government unit (LGU) capacities, adolescent reproductive health, financing, and public awareness of RH and the RPRH Law. 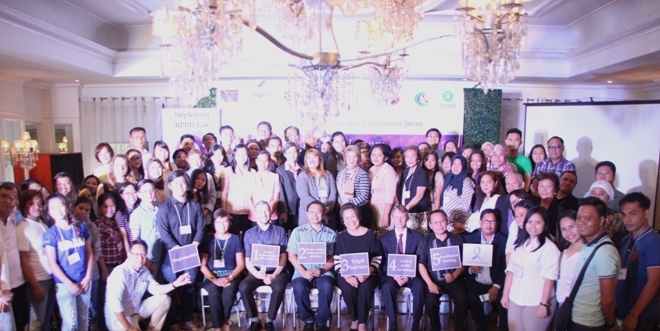 The activity concluded with a Purple Ribbon for Reproductive Health (PR4RH) movement re-launch, wherein individuals and organizations expressed their commitment to the cause, further widening its scope. Enacted in December 2012, the RPRH Law is a landmark legislation that has four key provisions: access to family planning, maternal and child health care, sufficient funding, and age-appropriate sexuality and reproductive health education. Yet, five years later, it continues to be beset by major challenges such as uneven implementation at the local level; rise in serious adolescent RH problems, legal barriers, insufficient funding, and lack of public awareness. Meanwhile, the maternal mortality ratio (MMR) remains high at 221 deaths per 100,000 live births. The contraceptive prevalence rate (CPR) and the total fertility rate (TFR) remain stagnant at 55.1 and 3.0 respectively. One in ten young women aged 15-19 have begun childbearing, and HIV has been declared a “youth epidemic” due to the rising number of HIV infections in the youth demographic. The “5 Taon, 5 Hamon” national dialogue is the second in a series of five national dialogues on RH. The first, held in March 2017, discussed roadblocks and focused on the most apparent challenge at the time: the two Supreme Court TROs. “5 Taon, 5 Hamon” is also part of #ImplementRH, a series of activities supporting the revitalized call for the full implementation of the RPRH Law.